One of the many terrifying aspects of having Donald Trump as president is that he, like all children, is very easily persuaded. Single meetings and conversations can shape his entire, pliable worldview. The wolves of corporate America know what easy prey looks like. Now, consider the very deepest structural problems that plague our nation. Among them is the outsized power of corporations—their ability to evade and overcome regulations that would benefit the common good by exercising influence in our broken political system. This is the structural problems that brought us hits like “The 2008 Financial Crisis,” and “All Toxic Pollution.” In normal times—even during a Republican administration—the constant tug-of-war between corporations and government regulations would play out in slow motion, susceptible to all of the intricacies of public pressure campaigns and Congressional lobbying and the arcane rules governing rulemaking processes at government agencies. In the past, in other words, even if you knew the Republicans were trying to help the rich and screw the poor, you could see it all coming. Today, who knows? We are in unpredictable territory. And that is what is so unnerving about Trump’s meeting today with the Business Roundtable, the group that lobbies on behalf of major US corporations. Trump asked the group to tell him what regulations they dislike, and they compiled a letter, and now we must contemplate the possibility that this letter will be used as road map for the administration to pursue the business world’s wishes directly. Requirements that companies disclose their use of conflict minerals. 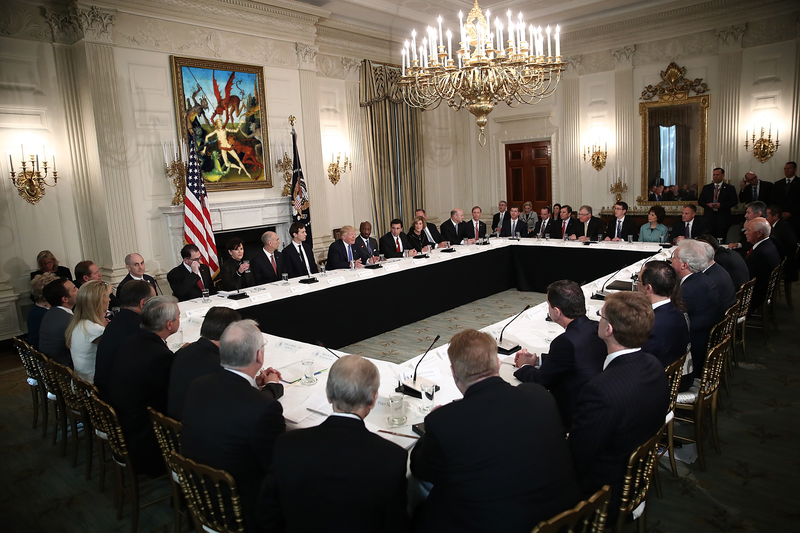 President Trump joked with manufacturing executives on Thursday during a business roundtable at the White House, goading the CEO of General Electric into telling a story about his success on the golf course... After inviting the group of corporate executives gathered in the State Dining Room to introduce themselves one by one, Trump interrupted Jeffrey Immelt, CEO of GE, to recall a golf outing the two had shared years earlier. Immelt obliged, drawing laughter from the room.